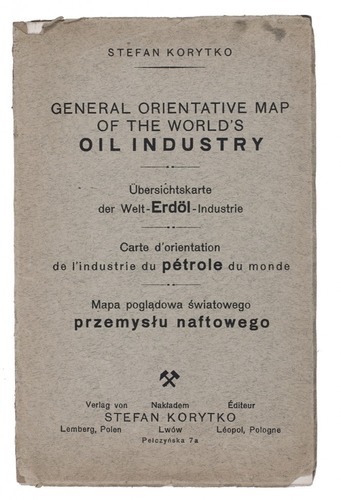 General orientative map of the world's oil industry | Übersichtskarte der Welt- Naphtha-Industrie | Carte d'orientation de l'industrie de pétrole du monde | Mapa pogladowa swiatowego przemyslu naftowego. Lviv, Stefan Korytko, 1925. 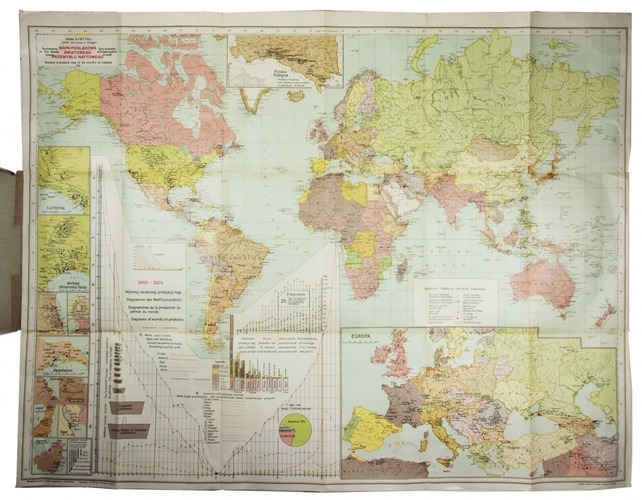 Large folding chromolithographed map (map size 65.5 x 88 cm). Original publisher's printed paper wrappers. 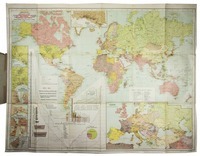 Large folding map of the world, completely in colour, showing the areas containing oil and where oil/gas wells are located. Inserted around the margins of the map are several more detailed inset maps of Europe, Poland, California, Kansas/Oklahoma/Texas, Mexico, Venezuela, Trinidad, Apscheron (Azerbeidzjan), Sumatra, Japan, Egypt and Borneo. Also included is a large diagram illustrating the world's oil production, from 1860 to 1924. Only very slightly worn along a few folds. Paper wrappers slightly damaged. Otherwise in very good condition.